DECIDING FACTORS MMS NOVEMBER 2018 28 mmsonline.com Data-Driven Manufacturing CONTRIBUTOR | Gisbert Ledvon is TNC Business Development Manager for Heidenhain heidenhain.us connect different types of machines if older machines can use an adapter for converting data into this format. Remember, MTConnect and other data-exchange protocols do not make up for data that a machine and its control are not designed to provide. Legacy machines with simple PLC-based control systems may need add-on sensors so even basic data can be acquired. Another hurdle may be that even some recent machine tools will not provide all the data necessary to analyze the process well enough, making it difficult to calculate accurate spindle loads and relate them to speed and feed records. Do You Preset Tools or Use Part Probing? If you want maximum run time on your machine, a preset station for tools and maybe even for parts is essential. However, if you rely on the operator to enter the presetter data manually, you will expose your automated process to addi- tional risk of using wrong tooling data in your machining program. 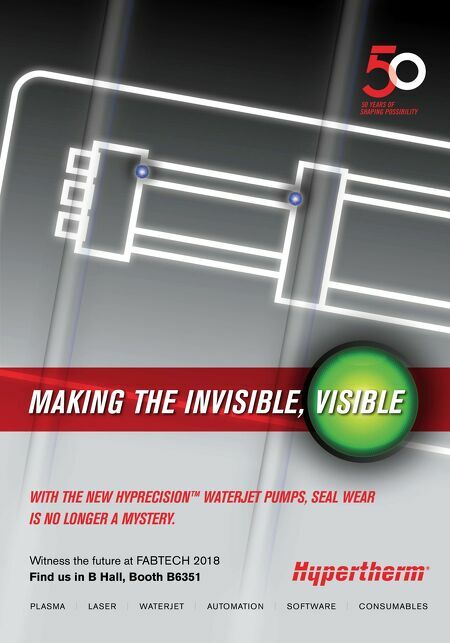 The ability to load the data from your tool preset station directly into the control's tool table avoids this danger. To facil- itate this data exchange, Heidenhain offers a software utility called Software Development Kit (SDK) that enables original equipment manufac- turers of peripheral devices such as tool preset- ters to create their own interfaces to transfer data into the TNC or read data out of the TNC via the DNC protocol interface. Have You Checked Your Postprocessors Lately? Postprocessors are critical components of your production f low, so checking to see that all post- processors ref lect the latest release of your CAM software as well as the latest updates to your CNC systems is recommended. Some controls (the Heidenhain TNC is one example) are backward compatible, meaning a post developed 10 years ago for an iTNC 530 will still work for a machine with a new TNC 640 mill-turn control. Of course, CNC suppliers develop new features and func- tions all the time, so check with your CAM pro- vider to ensure that the latest postprocessor ver- sion takes advantage of these advances. Do You Use Verification or Simulation Software? Program verification is critical if you machine parts on five sides in one setup or use full five- axis simultaneous machining. You want to make sure the tool path and rapid moves do not cause collisions that could destroy your part, or worse, your spindle and machine. Here are some recommended choices: Acquire one of the simu- lation software utilities like Camplete or Vericut to verify your programs with the actual tool path and actual machine kinematics. 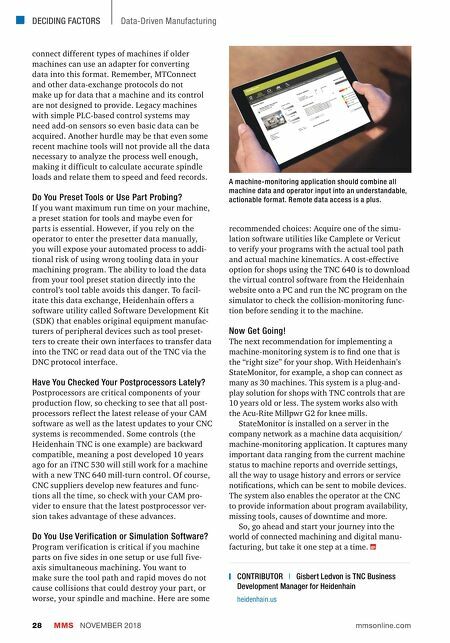 A cost-effective option for shops using the TNC 640 is to download the virtual control software from the Heidenhain website onto a PC and run the NC program on the simulator to check the collision-monitoring func- tion before sending it to the machine. Now Get Going! The next recommendation for implementing a machine-monitoring system is to find one that is the "right size" for your shop. With Heidenhain's StateMonitor, for example, a shop can connect as many as 30 machines. This system is a plug-and- play solution for shops with TNC controls that are 10 years old or less. The system works also with the Acu-Rite Millpwr G2 for knee mills. StateMonitor is installed on a server in the company network as a machine data acquisition/ machine-monitoring application. It captures many important data ranging from the current machine status to machine reports and override settings, all the way to usage history and errors or service notifications, which can be sent to mobile devices. The system also enables the operator at the CNC to provide information about program availability, missing tools, causes of downtime and more. So, go ahead and start your journey into the world of connected machining and digital manu- facturing, but take it one step at a time. A machine-monitoring application should combine all machine data and operator input into an understandable, actionable format. Remote data access is a plus.